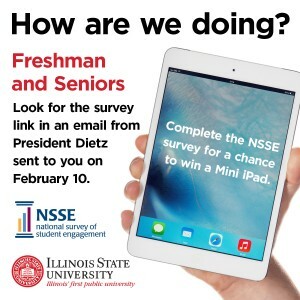 Freshmen and seniors: Look for the survey link in an email from President Dietz sent to you on February 10. Illinois State University wants to improve your educational experience, and you can help by completing the National Survey of Student Engagement (NSSE). All freshmen and senior students who complete the NSSE survey will be entered for a chance to win one of two iPad minis. NSSE helps Illinois State understand how students are spending time in and out of the classroom, which guides decisions that will benefit ISU students. In order to complete the NSSE, look for an e-mail from University President Larry Dietz on February 10. In order to be considered for the iPad mini, the survey must be completed by April 15. If you have any questions about this project at Illinois State University or how we plan to use the results, please contact Ryan Smith at rlsmith@ilstu.edu or (309) 438-2163.